When I first heard of the genre “Sludge Metal”, I immediately knew what to expect from it, and I was right. The word conjured up an image of slow, steady music that was in no rush to explode in any way, and was more than happy to stay deep and rumbling for as long as it damn well wanted to. USNEA are no exception to this formula, as their new release can demonstrate; the first track, “Lying In Ruin”, is nearly twelve and a half minutes long, and its intro and outro go on for an age. That’s not a criticism, either; for the style of music they both fit perfectly and frame the rest of the track rather well, with a mixture of foreboding ambiance and deep, menacing guitars over a heavy drum track. The vocals are an interesting addition to the mix as well; whichever vocalist is responsible for the screams has done a marvelous job of expressing his emotional and spiritual torment, even if it’s purely creative. The odd side to them is how quietly they’re mixed into the rest of the album; the guitars are far louder than the vocals ever become. This works nicely though, as the vocals consequently become blended into the other instruments of the band, instead of trying unsuccessfully to dominate each track, as some other bands attempt to do. One thing that’s fairly important to note, as it’s so apparent in the music, is that this is not a tuneful or Melodic album. There is little rhythm to embrace here, or any beat to settle yourself into. The music is often made up of seemingly random strings of notes plucked on a guitar, and what makes it enjoyable or beautiful is the mood it conveys. This is the case particularly in the intro of the titular track “Random Cosmic Violence”, which goes on for a long time but carries more emotion in it than many full-length songs manage in other bands. This is also an unusual Metal album as it can be very relaxing at times as a result of its incredibly slow tempo; you can almost wrap yourself up in the safety of the pacing, even with the occasional screams drifting through the guitars. It’s difficult to know what to classify this release as, since strictly speaking it should be an EP due to the small number of tracks. However the band have made those four tracks count, with each one lasting for the best part of 15 minutes, making the whole package last easily as long as a typical full-length album. This control over track lengths and number of said tracks counts for a lot, as many Doom or Sludge bands simply don’t know when enough is enough. 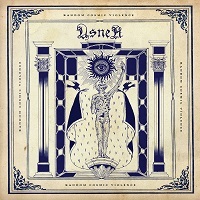 What USNEA does well here is combine the best parts of a genre, and include the majority of them individually within each song with some thoughtful writing. Check them out.